My friend Cindy of Oops! Desperate Blogger honoured me by presenting me with this wonderful award. I am truly touched that she has thought of me as a recipient. 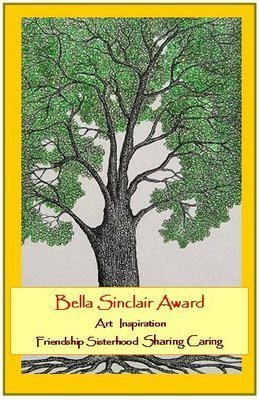 "I designed this award to celebrate art in the blogs and to honor the value of friendship, sisterhood, sharing and caring. It is to be awarded to the gifted, accomplished, eloquent and talented blogger whose friendship and influence inspire us to do our best. That I named it after Bella Sinclair is because she epitomizes all of these things. She is an inspiration to many of us." "I hope that when Bella returns, this award would have already circulated in the blogs. It is my honor to give this award to the first recipients who I hope will find the same pleasure as I have in spreading its crown, giving shade and the comfort of friendship and caring and of sisterhood by sharing this award with their blog-friends and sisters!" Once again, I would like to thank Cindy for this award and Ces for creating it. You'll need a blog dedicated to awards soon! Congratus Sue you totally deserve this. I adore Bella, if you haven't met her, she is truly one of the truest people you will meet and she is extremly funny. Sue I forgot to tell you how beautiful your comment on Mother Earth is. Congratulations on your award! I just found your blog through Renee's - I really like the comment you left about Mother Earth. Your blog is delightful! I'll be back, if you don't mind. Sue ~what can I say? That is so beautiful and I feel so lucky to have you as a friend. Thank you very much it's made my day! This award totally fits you ... and then I see that you've sent it my way as well & well, I am really touched. thank you. Thank you so much for thinking of me! Can I give it back to you? I would if I could. LOL! This is a beautiful and special award. What a wonderful blog and what a wonderful community. I am so impressed by all the talented people i have found!